Over 3000 children were treated in U.S. emergency departments in 2012 for eye injuries related to paintball guns, airsoft guns, BB guns and pellet guns, which are popular non-powder guns. A new report published in the Journal of the American Association for Pediatric Ophthalmology and Strabismus (AAPOS) analyzes the trends in hospital admissions associated with different types of firearms and suggests regulations that can help prevent serious injuries. Investigators from the Stanford University School of Medicine found that the rates for eye injuries from non-powder guns increased by 511% between 2010 and 2012, reaching 8.4 per million children. This rise was almost exclusively due to air gun related injuries, which parallels their growth in popularity, with paintball gun rates remaining low at 0.4 per million children. The U.S. Consumer Product Safety Commission (CPSC) documents emergency department visits for injuries secondary to a variety consumer products through the National Electronic Injury Surveillance System (NEISS). The NEISS draws from a stratified probability sample of roughly 100 hospital emergency departments of varying sizes and provides a nationally representative sample of hospitals in the U.S. These data make a clear distinction between paintball guns and other non-powder gun types, but further differences among other non-powder guns (BB gun vs. pellet gun vs. airsoft guns) may not be reported accurately. For the purposes of analysis, the authors grouped BB, pellet, and airsoft guns together. A review of 399 individual case reports of airsoft and BB gun injuries was also conducted by the researchers. Eye protection status was reported in 71 cases, and only one patient was purportedly wearing sunglasses, while 70 had no eye protection at all. In the early 2000s, BB gun manufacturers established internal restrictions on sales and marketing to minors, while the American Academy of Pediatrics and American Academy of Ophthalmology released a joint policy statement to promote eye protection for high-risk recreational activities. These and other efforts likely contributed to the drop in pediatric eye injuries until 2010. However, the researchers suggest that the rising popularity of airsoft guns, which are full-scale replicas of powder guns and which fire a lightweight, 6 mm plastic bullet, parallels the rise in injuries since 2010. Multiple sources have noted dramatic increases in the sales of air guns, but not paintball guns, as well as marketing efforts directed at teenagers. There are no federal laws regulating nonpowder guns, and only 22 U.S. states regulate the transfer, possession, and use of nonpowder guns. In the majority of states, minors are allowed to purchase and possess nonpowder guns. Only four states define some or all nonpowder guns as firearms and only three classify nonpowder guns as dangerous weapons. Caption: Map of states with nonpowder gun control laws. A total of 22 states regulate use and possession of nonpowder guns. States that define some or all nonpowder guns as firearms: IL, MI, NJ, RI. States that identify nonpowder guns as dangerous weapons: CT, DE, ND. 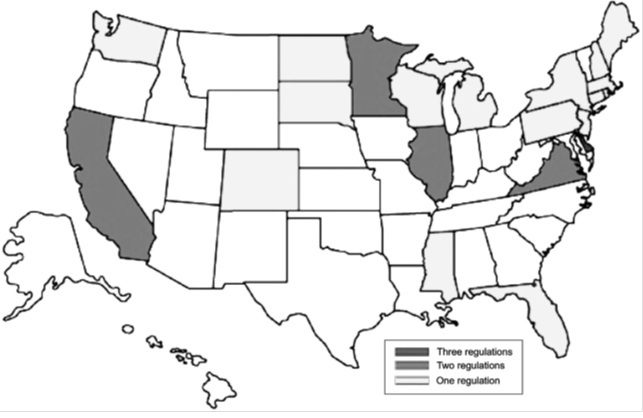 States that impose age restrictions on possession and use of nonpowder guns: CA, DE, FL, IL, MA, ME, MN, NY, NC, PA, VA. States that regulate possession of nonpowder guns on school grounds: CA, CO, DE, MN, MI, NC, NH, SD, VA, WA, WI. The District of Columbia also imposes age restrictions on nonpowder gun use. “Pediatric eye injuries due to nonpowder guns in the United States, 2002-2012,” by Rachel Lee, BS, and Douglas R. Fredrick, MD, DOI: http://dx.doi.org/10.1016/j.jaapos.2015.01.010. It appears in the Journal of AAPOS, Volume 19, Issue 2 (April 2015) published by Elsevier. Full text of the article is available at to credentialed journalists upon request; contact Eileen Leahy at +1 732 238 3628 or hmsmedia@elsevier.com to obtain a copy. Journalists wishing to set up interviews with the authors may contact Robert Dicks, Director, Media Relations, at +1 650 497 8364; rdicks@stanfordchildrens.org, or Samantha Dorman, Media Relations Manager, at +1 650 498 7056; sdorman@stanfordchildrens.org.